Dr. Pepi could use any nutritional product on the market. However, her commitment is to use only products that give her patients rave results. 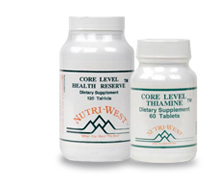 Core Levels have clinically proven to be the most effective supplements Dr. Pepi has found in restoring health. She has found that many other supplements were not only not effective but contributed to poor health. Core Levels provide specific vitamins and minerals, as well as targeted nutrition for different organs or body parts, such as the heart, lungs, prostate, liver and brain. Each Core Level supplement comes accompanied with the nutrients needed to make possible maximum absorption and to fully balance the primary nutrient so no nutritional thievery occurs. When determining the underlying source of your condition, Dr. Pepi determines which nutrients you are deficient in and recommends which supplements you should use. All Core Level supplements are made from natural plant, animal and mineral sources that have been chosen for their high quality. They are not synthetic and are in a raw state. Research has shown that enzymes and vitamins begin to be destroyed at a temperature of 104�. Core Levels are not heated above 98.6�. Core Level supplements cause virtually no allergic reactions. They contain no dairy, soy, wheat or yeast. They have no coloring, sweeteners, added hormones or flavorings. Whereas other B vitamins are yeast based and yeast is a common allergen, the B vitamins for all Core Levels are rice based. The facility where these are produced has been awarded an FDA blue ribbon. They are independently tested to the strictest standards to screen toxins. These are the purest and most effective supplements I have ever found. The body utilizes combinations of nutrients, not single nutrients. Each nutrient that a body needs requires complementary nutrients in proper ratio to ensure that it is processed. If these are not available in the supplement formula, they will be robbed from different locations in the body, such as from organs, bones and other tissues. Taking large doses of a single nutrient can cause stressful shortages in the body. Your body won't have to give up its own nutrients to utilize Core Level supplements. Each tablet of a Core Level supplement provides all the necessary nutrients in their correct ratios for any single nutrient to be fully absorbed. Learn more about this in Supplements Can Contribute to Disease and Aging. Each of the Core Level supplements contains digestive aids, enzymes and nutrients to support digestive organs. This allows them to be fully utilized by the body. Due to their high absorption rate, only low doses are needed. Most supplements pass through your system partially digested. It is common for X-ray technicians to see undigested tablets on X-rays. Through the use of Core Levels, you can support and improve the performance of a specific body part or organ, such as the heart, liver, bones, ovaries and adrenals. For example, you can strengthen your heart by taking Core Level Heart. There is Core Level Orchic that improves the function and hormone production of the testicles. Scientific research theorizes that putting a healthy gland cell within a body gives the body a blueprint for new, healthy cells. Core Level formulas often contain tissue from healthy animal glands. A gland is an organ that makes hormones. For example, the adrenal glands make adrenaline. Taking glandular material has been found to be a vital factor in the strengthening of any gland. There is a one-of-a-kind process used to obtain this glandular material for the Core Level line of supplements. Other glandulars contain significantly more fat and salt. The Core Levels work the gland up to doing its own job rather than continually bypassing its function. The Core Levels help the gland work, rather than continually doing its work for it, as is the case when taking hormones. Taking hormones actually puts the gland into a lower function, making it less able to produce its own hormones. In their research and development, Core Level supplements were directly tested on hundreds of patients to ensure that the supplements helped their bodies achieve chemical and structural balance. This is a unique approach in the nutritional field. Dr. Pepi knows of no other supplement line to use such extensive testing and research in a clinical setting throughout the formulation of each product. Other supplements are created through theories and without the same type of direct testing on patients prior to their release on the market. Dr. Pepi has used Core Level supplements to help thousands of patients achieve an ideal healing state, with spectacular results.